Some of the most complex and technically challenging projects in the highly-regulated nuclear industry are those that require both industrial hygiene and radiation protection controls. Every task must be managed with considerable care and planning to prevent the potential for human or environmental harm. While the project complexity may be different, the safety functions applied to complete tasks with care and quality have much in common with other construction-related industries. Every builder’s first consideration should be worker safety. The very best in our industry exercise prudence and keep safety integral to delivering efficient solutions. 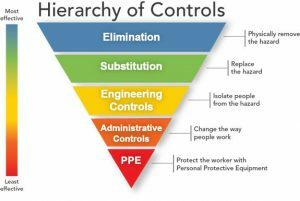 In the U.S. Department of Energy world, DOE contractors implement the Integrated Safety Management System (ISMS)1, applying five core functions: define the work scope; identify the hazards; apply hazard controls; perform the work within the controls; and utilize feedback to improve the process for next time. These functions can be applied in any construction setting to enhance worker safety. Enhanced work planning is essentially the effort to think through and prevent or control the what-ifs on a job site. The more hazardous the job, the more planning is required. Remember to always ask key questions: What’s the worst thing that can happen during your day-to-day activities? Do you have the right tools and are your people adequately trained? Are there communication mechanisms in place, even in remote locations? The skilled trades know their jobs well and know how to do work efficiently—does your safety plan fit their work processes? It’s important to include a review of work plans and procedures from the workers doing the job. It’s also imperative that health and safety staff develop an in-depth understanding of the tools, processes, management structure, interactions between management and workers, and safety culture of their company. Then, one must tailor program documents, procedures, tools and training for continuous improvement and efficiency gains while ensuring compliance with applicable requirements. Ideally, once you’ve determined the hazard, the goal is to eliminate or engineer the hazard out of the process. If that’s not possible, then put in place administrative controls to manage it. Regulations are created to keep workers, the community and the environment safe. A vital part of pre-planning is to understand the requirements for regulatory compliance and to perform work within those regulations. Beyond the enhanced work plan, every industry can and should look to its people for continuous improvement ideas and options. Hence, it is a good idea to encourage a questioning attitude. For instance, too often a worker will have concerns about a prescribed work process. Perhaps the individual simply has a passing thought that something is not right, but can’t quite put his/her finger on the problem—and, instead of saying something, stays quiet. It’s vital to reinforce open communication. You would be amazed at how valuable these extra eyes can be in terms of quality, cost and especially safety. We had a situation where one of our employees identified a rigging capacity discrepancy between the Material Handling Facility drawing and the Crane Plan. The two drawings had been reviewed multiple times by several different organizations and this discrepancy had not been identified. Because of the thorough review by our employee, and a willingness to bring up the concern even after the drawings had been reviewed multiple times, our team was able to avoid a potentially costly and dangerous problem. There’s nothing wrong with taking the time to back up and review a process to make sure it’s the safest way to perform a task. in dollars and image. A safety culture with a comprehensive work plan in place will save owners/contractors money in the long run—whether you’re in the nuclear industry or in any other hazardous business. Ellen Messer Wright joined NV5 in 1999 and currently serves as Safety & Health Consulting Manager at the NV5 Richland, Washington office. She is a Certified Health Physicist (CHP) with 24 years of health physics-related experience assisting clients with worker safety and health, radiation protection, radiological assessments and training, and application of governing regulations and standards. Ellen has extensive knowledge of U.S. Department of Energy rules and orders, including 10 CFR 835, Occupational Radiation Protection; 10 CFR 851, Worker Safety and Health Program; and radiologically- related orders and standards.